PRICE, SERVICE, QUALITY...at most places you pick any two...but at STEVENS you get all three! WANT A FLAG OR FLAGPOLE QUOTE? CALL US TOLL-FREE OR EMAIL OR FAX. No obligation! CLICK ON U.S. FLAG POLE IMAGE BELOW FOR FULL-COLOR FLAG CATALOG. Our goal is always to beat reputable competitors regarding the supply of all Made in the United States flags, of the same best quality materials & finishing, and still extend the very best service. IF OUR QUOTED PRICING IS NOT ATTRACTIVE, PLEASE LET US KNOW AND WHY AND WE WILL EXCEED YOUR EXPECTATIONS! CLICK HERE ON BLUE LINK FOR COMPLETE CUSTOM BUSINESS FORMS CATALOG: www.bfands.com then call, email, or fax us to discuss details, timing & pricing. CLICK HERE on blue link for extensive picture catalog of stock or custom banners, pennants, flags, & accessories: www.xyzbanner.com, then call, email, or fax us to discuss details, timing & pricing. CREATE YOUR BUSINESS PRODUCTS WANT LIST ON OUR ON-LINE CATALOG ORDER FORM AND FAX, EMAIL, OR PHONE IT IN TO US. You can call in advance for your special net pricing if you desire; to return to STEVENS homepage, click on STEVENS in your web address index. Click on blue box to browse 26,000+ item Business Products Catalog. Use Compare Feature & Add to List. CLICK ON BOX TO LEFT TO BROWSE OUR 26,000+ ITEM OFFICE PRODUCTS CATALOG: PRICES SHOWN ARE MANUFACTURERS' SUGGESTED LIST PRICES AS OF PUBLICATION DATE. FOR YOU, WE MARK UP FROM COST... ASK US FOR YOUR NET PRICE REGARDING ITEMS OF INTEREST. INCLUDES OFFICE, COMPUTER, DRAFTING, ART, JANITORIAL. BREAKROOM, MAILROOM, PACKAGING, SAFETY, SECURITY, & FIRST AID SUPPLIES; OFFICE FURNITURE; FILING CABINETS & SUPPLIES; OFFICE MACHINES; RUBBER STAMPS; WRITING INSTRUMENTS & MARKING DEVICES. AND, WE CAN SUPPLY MANY RELATED ITEMS NOT LISTED...ASK US! 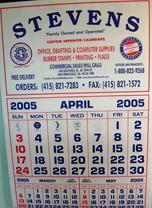 Ask to see our full-color catalog for custom printed wall calendars: No better ad value! Excellent gift for your customers for year long 24/7 exposure for your company for a modest one-time price. Order early to get your customers' wall space before each new year! CLICK ON U.S. FLAG FOR FULL COLOR FLAG & FLAGPOLE CATALOG PRICES SUBJECT TO CHANGE WITHOUT NOTICE. We offer Frequent Flyer/Commercial User discounts...ASK! 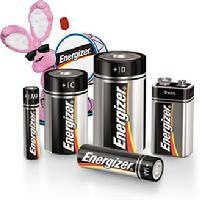 Click on above image for battery finder Wizard! Click on above image to view catalog & order custom rubber stamps & signs on-line: no obligation to just view. Family Owned & Operated "Since 1927"
- Location: Please send all payments & mail to 623 Baker Street, San Francisco, California 94117-1407. Access by appointment only. You get MAXIMUM PERFORMANCE with LOWEST TOTAL ACQUISITION COST. We believe in words like "Pride" & "integrity" & "credibility". Sound old-fashioned? But there's nothing old-fashioned about our service! We are properly staffed by knowledgeable, understanding professionals with years of experience to engage in "low-tech" conversations that zero in on how best to meet your needs and save your time. (Remember: costs of supplies are less than 1% of office overhead, while employee wages make up 80-90%, so don't waste their time shopping: call STEVENS instead!) Free local delivery for office products to open accounts. Yes, it is possible to get HIGH SERVICE LEVELS AND LOW PRICES! Ask us for references and see. We are indeed rapid, flexible, and reliable, "Since 1927". YOUR COMPLETE SATISFACTION IS GUARANTEED!! STEVENS is a certified local, MBE, Vietnam Veterans owned, small business enterprise. satisfied customers. If you value the services of a small, family run business staffed by people who care deeply about making our relationship totally comfortable and satisfying, please mention STEVENS to your friends, colleagues, and successors. Your source for any stock or custom flag, flagpole & banner: Made in the USA! Get the BEST memorial flag case: genuine solid red oak or black walnut: no veneers/particle board/stains! The natural grain shows through the tung oil/varnish. Unbreakable clear Acrylic front. We serve with pride"Family Owned & Operated Since 1927", a very traditional "clip joint"!